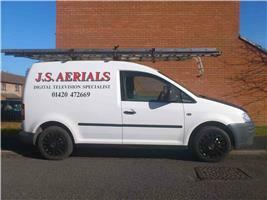 JS Aerials - TV Aerials/Satellite Services based in Lindford, Hampshire. JS Aerials was set up in December 1984 in Liphook Hampshire, then shortly after moved to Bordon (1985). We have been serving the local community and surrounding areas ever since. We offer free quotations and advice, a rapid service, often next day and all our work is guaranteed for one year. We specialise in all aspects on TV from poor reception to new aerials and satellite dishes, we have public liability insurance and insurance for TV wall mounting.